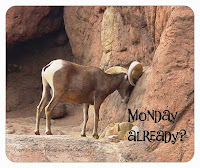 Tucson Daily Photo ~: Is this how you feel today? For any of you who may have eaten a wee too much yesterday or maybe were "toasting" just a little too often, take some advice from the magnificent bear at the Arizona Sonora Desert Museum - REST! Hope your holiday was wonderful!